Titan One Firmware 2.25 and Gtuner updates! Titan One Review: Jack of all trades. 8.00 – Great! Titan One review by Ken McKown from ZTGD.com! Thank you for your time and effort in reviewing our product! Just adding an useful information. The Titan One device is totally lag free, even when using Bluetooth technology. The Dualshock 3, Playstation Navigator, Wiimote, Wii U Pro will work without lag in wireless mode right out of the box. For Dualshock 4 we suggest enable the “InFrame Out“, “1ms Response” AND “BT DS4 Boost” settings for best results and no lag. “Controller preference has been a deciding factor on which console I buy games for more often than I care to admit. The Xbox 360 controller was near perfection, then along came the Dual Shock 4 and it almost re-invented the wheel. Still, there are certain genres of games I prefer to play with Microsoft’s offset stick layout. So many choices, so little compatibility. That is until now. I got to play around with the Titan One, a USB device that lets players use just about any controller on the new machines, and it is glorious. Playing Killer Instinct with a DS4, or Killzone with a 360 controller really changes the landscape. It all feels like sorcery, especially when the PS button also works as the Xbox button. It feels unnatural. The best part about this for someone like me is that I can use all those fight sticks I bought for Xbox 360 on both of my new consoles. Killer Instinct and Injustice are so much slicker with a proper arcade controller. etup is simple for the most part. 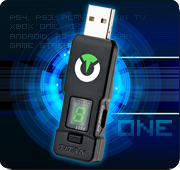 The Titan One looks like an oversized USB stick, and once plugged in, snapping any controller into its USB slot matches it up with the system. There are some exceptions, for example the Xbox One does not like to play nice out of the gate. Instead I had to log in with my actual controller to make the system recognize the Titan One as a valid controller, then I could switch over to whatever I wanted. It isn’t ideal, but it does work. Also, keyboard and mouse support works for consoles. Again through some magic and setup though. The Titan One has to be routed through a PC in order for it to work. The interface is easy to use though, and for anyone wanting to go that route, it does work. Not only does the Titan One let players use any controller on any system (yes I hooked up a Wii remote to the Xbox One, no I don’t recommend it) but it also allows for controller modification. Think of it as having your own programmable controller. This means I could set macros, enable things like rapid fire, or download one of many scripts from the growing library on the Console Tuner website. Now, I don’t advocate using hacks for controllers in online games as I feel it is a mild form of cheating, but for certain offline objectives or repetitive motions, I find it perfectly viable and effective. Loading scripts and mods into the Titan One is simple. The dongle comes with a USB cable that plugs into the PC. From here there is a piece of software that is used to dump them into the device. Then, once the controller is synched to the Titan One, simply tap the button on the device to switch between the available scripts. Simple and effective. The Titan One is a very cool device that lets me decide which controller I want to use for which games. Adding fight stick support for my older sticks is a definite bonus. Console Tuner has done what Sony and MS simply could not. The small setbacks are definitely troublesome, but overall this is a must-have for anyone looking for some controller variety. MaxAim DI 4.15 Release. New Features. MaxAim DI 4.15 for Titan One Device. Thanks for all ConsoleTuner members who helped us with ideas and suggestions to improve MaxAim DI. Three decimal digits on the acceleration and Sensitivity adjustments. DirectInput analog sticks deadzone configuration, for concurrent use of the DirectInput Controller and the Gamepad. Plus bug fixes and operation improvements. Titan One review by Paul Acevedo at WPCentral.com! Thank you for your time and effort in reviewing our product! “You know, the Xbox One controller is pretty great. It features a much superior d-pad to that of the Xbox 360′s, and unparalleled rumble in the trigger buttons to boot. On the other hand, the bumper buttons are a step back from the 360′s, and will never be as responsive as you’d want in a game like Killer Instinct. A company called Console Tuner is on the case. They have engineered a USB peripheral called the Titan One that lets you use Playstation 4 controllers with the Xbox One, and vice versa. In fact, you can even use Xbox 360, Playstation 3, and pretty much any USB controller on your modern consoles. You have to admit, that sounds like an especially useful accessory. The Titan One works with five platforms: Xbox One, Playstation 4, Xbox 360, Playstation 3, and PC. It allows users to play games on those platforms with most major controllers from a wide array of other platforms, including the five I just listed, plus those of the Nintendo Wii and Wii U. Basically, if you’re more comfortable with a particular style of controller, you can get a Titan one and start using that controller with all of your modern gaming systems. PC players can get some use out of the Titan One as well. The Xbox and Playstation controllers will work automatically when connected through the device, without the need for separate drivers. That’s good because Sony controllers tend to require some effort to get working on PC. Xbox controllers already have PC drivers, although it took quite some time for Microsoft to release Xbox One drivers. Oh, but what if you’re one of those snotty guys who insists on playing everything with a mouse and keyboard? Well Mr. Superior, the Titan One also allows the use of mouse and keyboard on Xbox and Playstation systems. You have to connect your computer to the Titan one through its PC port while you play with your fancy typing and pointing devices, but at least it’s possible. Could the mouse and keyboard option give Titan One users an unfair advantage in online console games? That remains to be seen. Naturally, using one system’s controller with another system could lead to issues in which the buttons aren’t mapped comfortably and things like that. Titan One lets players remap and save their buttons as custom configurations. You can save a configuration for just one game if you want, and switch to another for your other juegos. It saves up to nine configurations at one time. It goes deeper than that. You can enable turbo functionality on any controller, allowing players to hold a button and cause it to be pressed repeatedly in-game. If you’re a little more inclined to cheat (or just need help with complex maneuvers), you can also create and use macros that will perform a series of button presses with a single touch. That would be handy for people who can’t pull off the super moves in Street Fighter or Killer Instinct. Titan One has its own PC software that lets you set up those custom configurations and macros. I imagine it might be hard to create those things on your own. But the software lets players download other user-created configurations, so you can grab those instead of manually tinkering. Cross-controller compatibility: rad or bad? As a controller enthusiast, the idea of using one system’s controller on another system is very enticing. I’ve long wished I could use my USB Sega Saturn pads with my Xbox systems, but I’ve never been able to do that. And I know some people out there prefer Sony controllers, even though Xbox stick placement is actually more ergonomic. Do you guys find this peripheral intriguing? I’ll try to get my hands on one so we can bring you a full review soon.